Rangoon – The Burmese government and army should urgently ensure humanitarian aid can reach ethnic Rohingya and other vulnerable populations in northern Rakhine State, Human Rights Watch said today. Government security operations have cut off assistance to tens of thousands of people and forced many to flee their homes. The United Nations and donor governments should publicly call on the Burmese government to ensure aid organizations can reach those in need. On October 9, 2016, armed men attacked three police outposts in Maungdaw township near the border with Bangladesh, killing nine police officers and seizing weapons. The President’s Office blamed a previously unknown Rohingya group called Aqa Mul Mujahidin for the attacks, though other officials have said it is unclear who was responsible. Government security forces declared the area an “operation zone” and began sweeps to find the attackers. According to senior members of the government, security forces have killed 30 people, while five members of the security forces have also been killed. However, reporting is heavily reliant on government sources as journalists have been denied access. Rohingya activists have alleged that government forces have committed serious abuses during the current operations, including summary executions and the burning of villages. A number of UN agencies and nongovernmental organizations have long operated in northern Rakhine State, including the UN High Commissioner for Refugees (UNHCR), WFP, Medecins Sans Frontieres, and Action Contre la Faim, providing food aid and mobile health clinics, among other services. WFP alone assists 152,000 vulnerable people with various services, including nutrition support for pregnant women, nursing mothers, children under 5, and people living with HIV and tuberculosis. 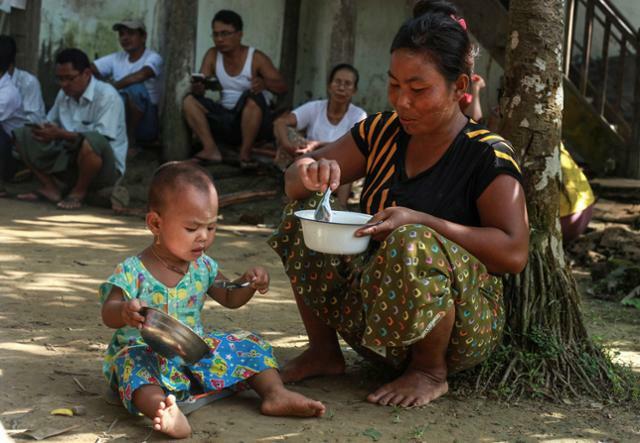 WFP told Human Rights Watch that while the government has recently permitted the resumption of food assistance to 37,000 people in Buthiduang township, 50,000 people remain without food aid in Maungdaw. The blocking of aid will also severely impact nutritional programs and mobile health clinics that serviced the area, aid workers said. With freedom of movement restricted, ill or wounded people cannot access the main hospital in Maungdaw. Humanitarian organizations said the violence has displaced some 3,000 ethnic Rakhine people and as many as 15,000 Rohingya, but the lack of access prevents an accurate count. Rohingya constitute approximately a third of Rakhine State’s population of over three million people. The Muslim minority has long suffered from discrimination and a host of serious human rights violations, including restrictions on the rights to freedom of movement, access to health care, and education. Successive Burmese governments have effectively denied Rohingya citizenship under Burma’s discriminatory 1982 Citizenship Law. The fighting has also increased tension in the camps for the nearly 120,000 displaced Rohingya near the town of Sittwe in Rakhine State. These people fled their homes after communal violence in 2012, which left large numbers of people dead and entire villages destroyed.